Nestled between Estonia and Lithuania, Latvia has a small but developing tourist industry and the country is authentic and welcoming. The Baltic coast stretches 500 km (310 mi) along Latvia's northern border, and lush green forests cover nearly half of the country. Founded in 1918, Latvia was occupied by both the Nazis and the Soviet Union, who incorporated the country and did not restore independence until 1991. Centuries of foreign rule have created a mix of ethnic backgrounds, yet preserved the national language. A Latvia holiday can include everything from urban excitement in the cosmopolitan capital of Riga to relaxation and recreation in the gorgeous countryside. Riga Region: Housing the nation's capital, this region is known for its cities' towering church spires, historical buildings, and quaint villages in the picturesque countryside. Kurzeme Region: Known for its cultural and historical heritage, Kurzeme Region also boasts white sand and pebble beaches, charming villages, forests, and the widest waterfall in Europe. Zemgale Region: Art and architecture fans should consider adding Zemgale to their Latvia itinerary, where flat plains are decorated with castle mounds, manor houses, parks, and other inspired Baroque and Rococo structures. Vidzeme Region: Vidzeme is known for its medieval ruins and rugged natural beauty perfect for skiing and hiking during your Latvia trip. Jurmala: Spend a relaxing Latvia vacation in Jurmala riding your bike along the coast, taking in the white beaches and Art Nouveau wooden houses, or checking out the numerous spas. Riga: Visit Latvia's capital--also known as the Paris of the North--to see its huge, World Heritage-listed collection of Art Nouveau architecture. Night owls will also appreciate the booming nightlife in dozens of bars and clubs. Old City Riga (Vecriga): Your Latvia trip may very well start here, where historical churches and cathedrals line a long cobblestone street. You'll find numerous attractions in the quarter, including House of Blackheads - CLOSED and Swedish Gate (Zviedru Varti). View of Riga from St Peter's Church Tower: Take the elevator up St. Peter's Church Tower for a 360-degree view of the capital and educational displays about the structure's history. Museum of the Occupation of Latvia: Dedicated to the time when Soviets and Nazi Germans invaded, this museum displays photographs, documents, and historical artifacts as well as personal accounts of Latvian citizens during these periods. House of Blackheads - CLOSED: A popular Latvia tourist attraction, this 14th-century house once served as a meeting venue for social organizations and is lavishly decorated with carvings, reliefs, and embedded statues. Riga Town Hall Square: Admire symbols of Latvia's independence, including its town hall and a statue of Roland, in this square full of museums and historical buildings that were largely reconstructed after World War II. Freedom Monument (Brivibas Piemineklis): Dedicated to the soldiers killed during the Latvian War of Independence, this copper statue features three stars held above a high obelisk and an ancient warrior standing between two modern soldiers. St. Peter's Church: As one of the oldest and most valuable monuments of medieval architecture in the Baltic states, this Lutheran church and World Heritage Site once suffered considerable damage during World War II but now features exhibits and an observation deck offering a view of the city. Jurmala Beach: Relax on the white sands, admire the wooden Art Nouveau houses, and enjoy the cafes, playgrounds, and largest waterpark in northern Europe. St. Mary's Dome Cathedral: This cathedral once served at the archbishop's seat and houses the Dome organ--the largest in the world at the time of construction in the 19th century. Art Nouveau building: Gain a deeper appreciation for early 20th-century Latvian style at this museum dedicated to Art Nouveau residences, and don't miss the ornamental ceiling paintings. Riga Region makes a great starting point for any Latvia trip, especially when traveling with kids. The capital boasts a huge list of attractions like parks and museums, plus shopping malls, cinemas, arcades, and entertainment venues. For a bit more nature, head to Jurmala, a city surrounded by rolling hills, lush pine forests, and white sand beaches. Vidzeme Region offers plenty of outdoorsy Latvia vacation ideas, where you can get away from the noise of busy cities. Keep an eye out for charming villages, too, where kids can learn about Latvia's culture and explore the handmade crafts and sweets available in most areas. Filling your Latvia itinerary with kid-friendly activities is fairly easy. In Riga Region, check out the numerous parks, like Pilsetas kanals, a lush space with medieval canals once used as barriers between the town and its enemies. Today, the park is a peaceful escape with gardens, kayaks, and lots of ducks to feed. If animals strike your children's fancy, head to Riga Zoo, home to some 500 species and 4,000 critters in all. Get up-close-and-personal with the residents in the reptile room, watch the leafcutter ants at work, or pet a goat kid in the petting zoo. In Jurmala, look for Livu Akvaparks, a waterpark featuring indoor and outdoor attractions for children and adults alike. Whether the family enjoys thrilling slides and wave pools or lazy rivers and sun loungers, this attraction has it all. If you prefer to swim in a more natural, quieter setting, head to Jurmala Beach, with white sand and calm waters for easy swimming. Cafes and restaurants are placed alongside the shoreline for convenience, and an abundance of water sports like kayaking are also offered. Summer is a perfect time to hike around in Vidzeme Region, or, if you've come during the winter, head up the mountains for some skiing. Many of the resorts here offer classes for every skill level and age, so the whole family can enjoy the activity. If you're sightseeing in Latvia with little ones and don't want to lug a stroller all over the place, many large cities offer rentals. Look up children's equipment rental services in the area where you'll be staying for strollers, car seats, and more. Delivery and pick-up services are often offered as well. Pork features prominently in Latvian cuisine, so expect to almost always see it in one form or another with every Latvian meal. Even if you order a dish without pork, the chef may cook the food in bacon fat, so be very careful if you prefer to avoid pork. Eating light on your Latvia vacation may be a challenge, as dishes tend to be very hearty. Potatoes are the most common vegetable, whether boiled, fried, or mashed, though boiled buckwheat ("griķi") can sometimes be requested as a substitute. If shopping is your game, you'll have the most choices in Riga. Popular brands like Armani, Calvin Klein, Zara, Gucci, and many more are available on high-fashion shopping streets and malls. However, if you're looking for a more unique souvenir, try outlying villages and old towns and look for special handmade products like linen, wooden toys, and dolls. Originally settled by Baltic tribes in 3,000 BCE, Latvia emerges in ancient history when it established trade routes to Rome and Byzantium and traded amber for metals. Official government was eventually developed by the tribes in the 10th century CE, but Germany controlled the land by the 13th century, when German crusaders sought to convert the pagans by force. The following years were turbulent for Latvia, when its territory was divided among foreign powers. After the Livonian War, Latvia fell under Swedish and German rule. Although the ancient Baltic tribes had emerged to form the Latvian people with a united language, the boundaries of Latvia's land had still not been established. Tsarist Russia took over the territory in the 18th century, and during the Great Northern War many of its citizens died of plague and famine. Conflict again ravaged the land during World War I, and the Latvian people demanded independence from the Russian Empire. The new country won its independence in 1918 and joined the League of Nations in 1921. But the young nation's tribulations were far from over. In World War II, much of Latvia was occupied by the Germans, who killed an estimated 75,000 Latvian Jews. When the Soviet Union took control of the country after the war, another period of transformation commenced: native Latvians were deported to other areas of the USSR, while immigrating Soviets altered the makeup of the population. Latvians were forced to adopt the Soviet system, including methods for farming and education. To learn more about this dramatic period, include a visit to Museum of the Occupation of Latvia on your Latvia itinerary. Upon the collapse of the Soviet Union in 1991, Latvia once again became an independent country and joined the European Union in 2004. At the date of independence, citizenship was only granted to those who had been citizens of Latvia in 1940 and their descendents. As a consequence, scores of ethnic non-Latvians did not receive Latvian citizenship. By 2011, more than half of these non-citizens had taken naturalization exams and received Latvian citizenship. Still, thousands in Latvia have no citizenship to this day. Self-control is very important in Latvia, which includes lowering your voice and avoiding eye contact between strangers. On your tour of Latvia, refrain from loud displays of emotions, especially anger, in public or around strangers, and instruct your children to do so as well. Do not be offended if Latvians ignore you as a stranger, because they may not acknowledge you until you have been introduced. Take a Latvia holiday during midsummer and experience the midsummer festival, the nation's most important celebration. Parties last all night with bonfires, songs, dancing, and beer. Weave wreaths of flowers for your hair and don't forget to try some of the Latvian cheese consumed during this time. Another popular festival, Martini Day, has nothing to do with alcohol but rather celebrates historically the end of the threshing seasons and the start of linen processing. Today, farmers put crosses on their doors to ward off evil spirits and families eat meals of bread, chicken or goose, honey, and Martini balls (made with peas, beans, potatoes, and flax). Boasting a temperate climate, Latvia temperatures are usually mild and humid. Winter months bring snow and sunshine but rarely dip below freezing. If you're visiting in winter, bring warm clothing like hats and gloves while sightseeing in Latvia. Average summer temperatures hover around 19 C (66 F), and though some days can reach up to 35 C (95 F), remember that nights get quite cool, so pack layers. Rain gear is also advisable for July and August, when thunderstorms are frequent. Large cities and towns are can be reached by train, but the bus routes offer more destinations and lower fares. Most buses include comfy seats, air conditioning, and luggage compartments. Minibuses are also available, offering faster transport while sharing with other travelers. The official language in Latvia is Latvian, although many citizens also speak Russian due to compulsory study during the Soviet period. 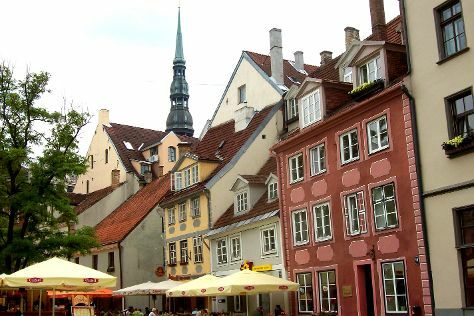 Some English is spoken in larger cities, but if your Latvia itinerary takes you beyond urban areas, consider bringing a phrasebook or small dictionary. If a service charge is included in your bill, it is not necessary to leave an additional tip. However, in the case it is not included, you should leave a tip of 10 percent in restaurants and cafes. Tipping in taxis and hotels is not expected but is a polite courtesy.